A mineral is a naturally-occurring, solid, inorganic, crystalline substrance having a fairly definite chemical composition and having fairly definite physical properties. At its simplest, a mineral is a naturally-occurring solid chemical. Currently, there are over 4900 named and described minerals - about 200 of them are common and about 20 of them are very common. Mineral classification is based on anion chemistry. Major categories of minerals are: elements, sulfides, oxides, halides, carbonates, sulfates, phosphates, and silicates. To find a native element in nature, it must be relatively non-reactive and there must be some concentration process. Metallic, semimetallic (metalloid), and nonmetallic elements are known in their native state as minerals. Electrum (AuAg) is an alloy (mix) of elemental gold and silver with >20% Ag. 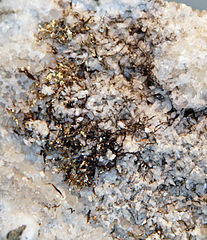 Most “gold” mineral specimens have some silver mixed in as well. Electrum has a metallic luster; ranges in color from silvery to golden yellow, depending on the silver content; has a high specific gravity (it's heavy for its size); has no cleavage; and is malleable. 当前 2015年6月12日 (五) 05:44 1,266 × 1,465（1.86 MB） Tillman Cropped version of File:Electrum on quartz (Tertiary; Smuggler-Union Mine, Telluride, San Juan Mountains, Colorado, USA) 1 (16674567643).jpg using CropTool.